Their first location is in the heart of MIT and is extremely popular with the students; the second location is only a few blocks from Central Square, but it is surrounded by residential homes and plagued by the never-ending construction on Western Ave. It was empty when I went in to pick up lunch. They have authentic entrees, as well as Tex-Mex options. The filling choices are plentiful: chicken, tinga chicken, shredded beef, ground beef, carnitas, lengua, chorizo, al pastor or veggies. There is also steak and shrimp available for an extra $1.50. 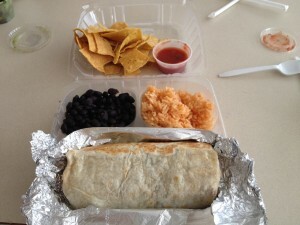 I had a 12” super burrito ($9) filled with carnitas, cheese rice, beans, guacamole, sour cream, lettuce and tomatoes. It came with a side of bean (black, refried or pinto), rice, a small bag of chips and salsa and a can of soda - not a bad deal for lunch. I thought my burrito was delicious; the pork was succulent and flavorful. I liked the rice and beans and the chips were homemade. The only misstep was the salsa; it was thin and watery. I will definitely be back to try some of their other options. The space is small, but there is a nice outdoor patio and they will be getting a liquor license soon.